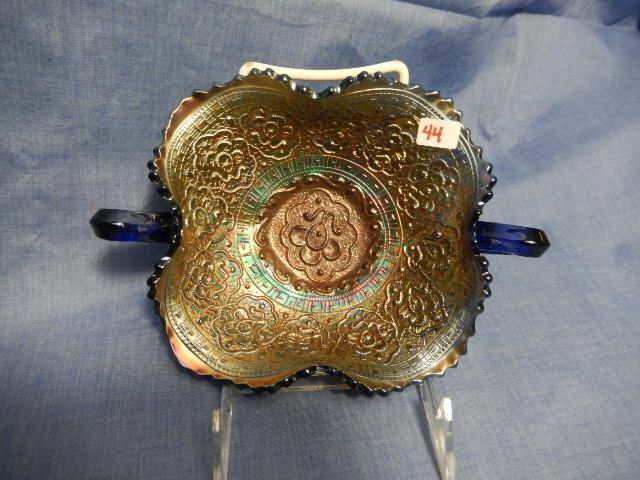 Persian Medallion, with it's ring of embroidered medallions, displays a definite Moorish influence. 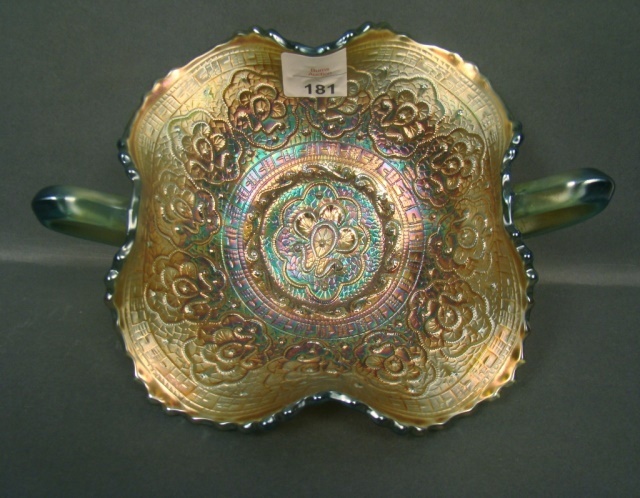 The pattern was produced from about 1911 to the early 1920s. 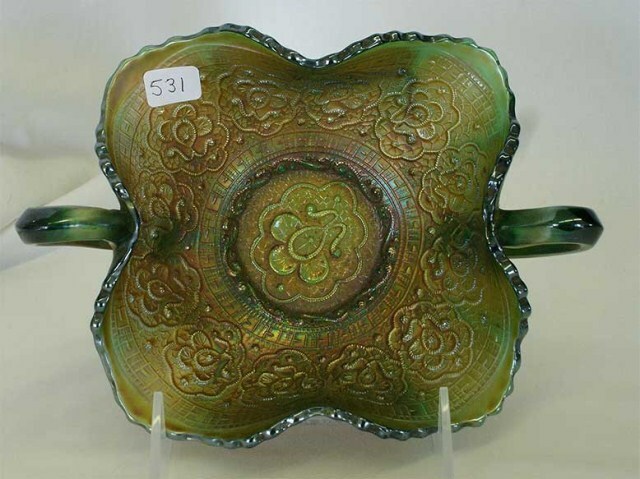 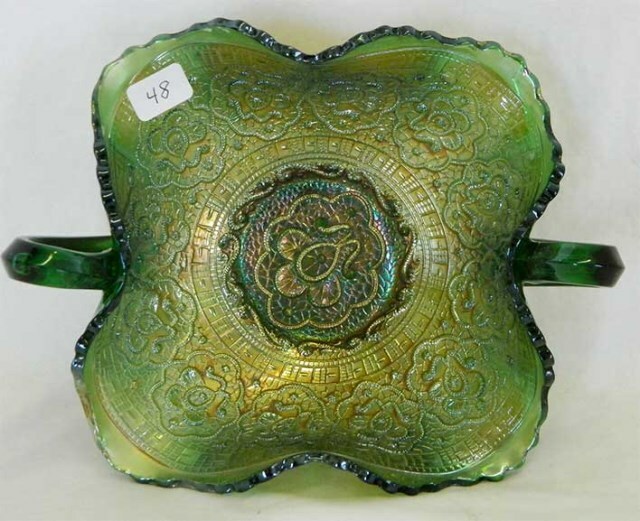 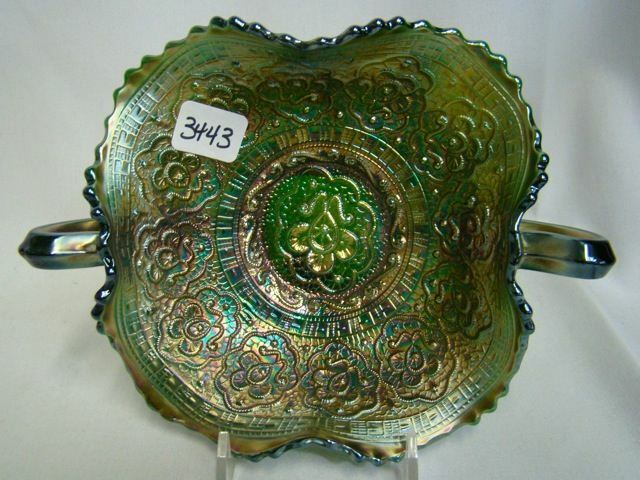 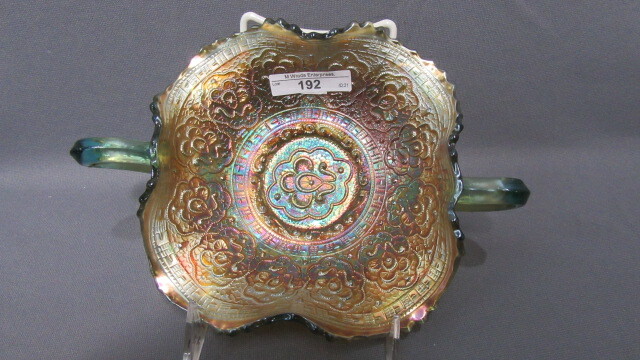 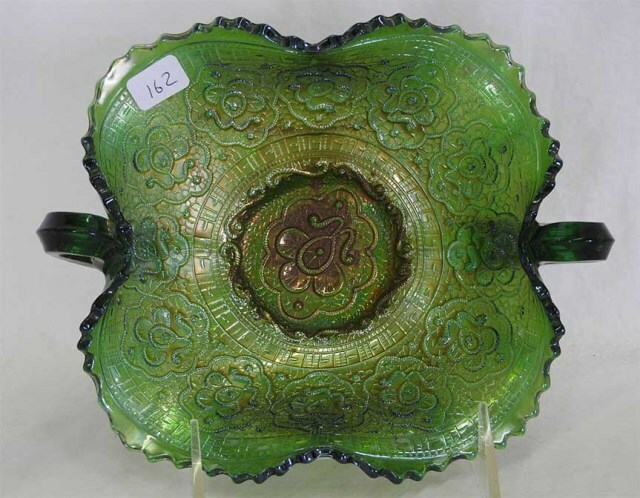 Nine-inch plates, like the one shown above in green, are quite hard to find. 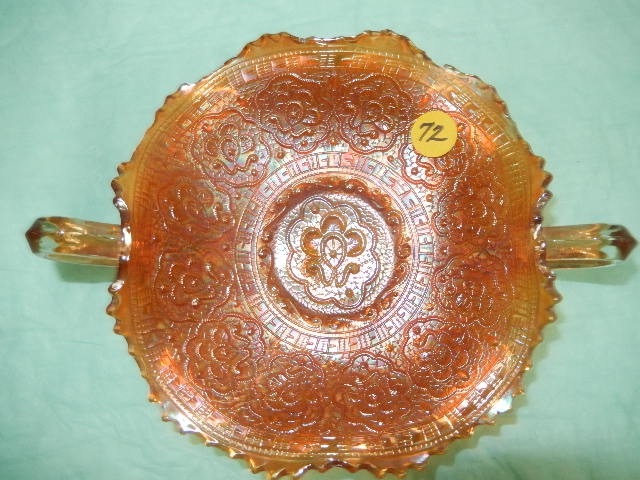 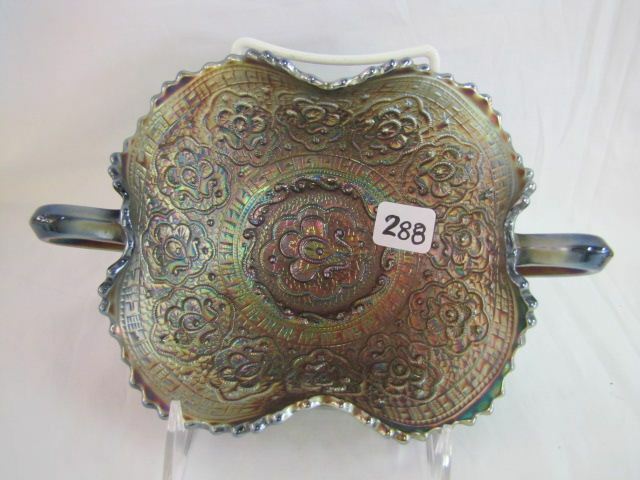 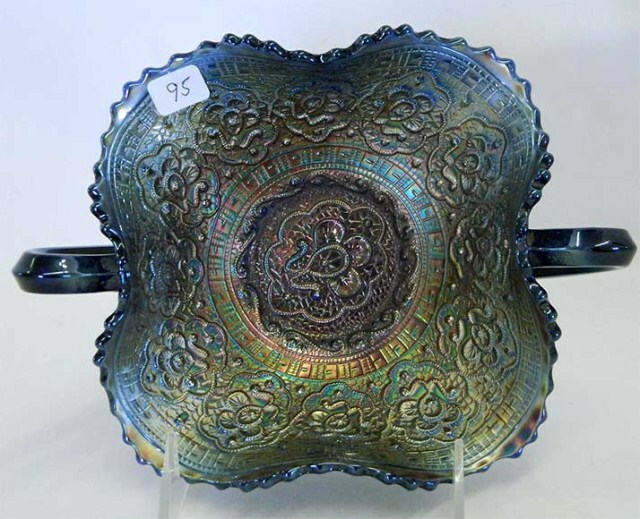 There are also 6-inch plates, 7-7 1/2 inch plates, and very rare chop plates. 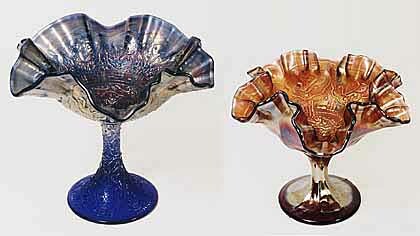 The bonbons are distinguished by the wide range of colors in which they are found. 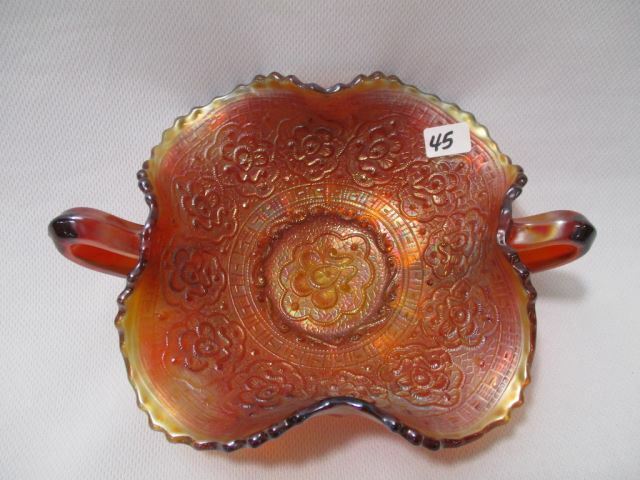 The one shown is in red, a fairly common color in this pattern. 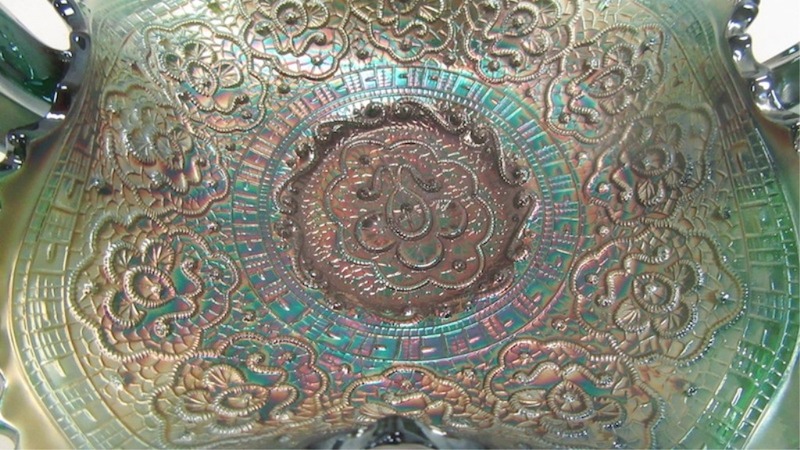 The Persian Medallion pattern was used on the interior of some Wreath of Roses punch sets. 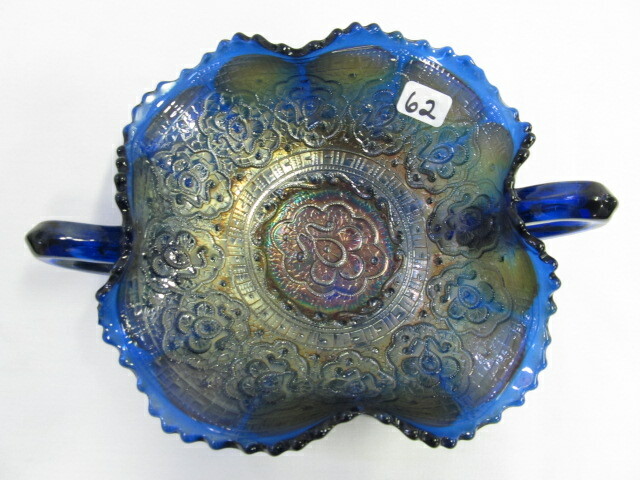 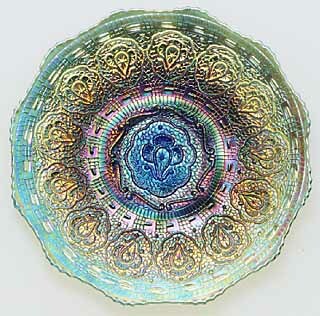 Fenton reissued Persian Medallion plates, bowls, goblets, and compotes. 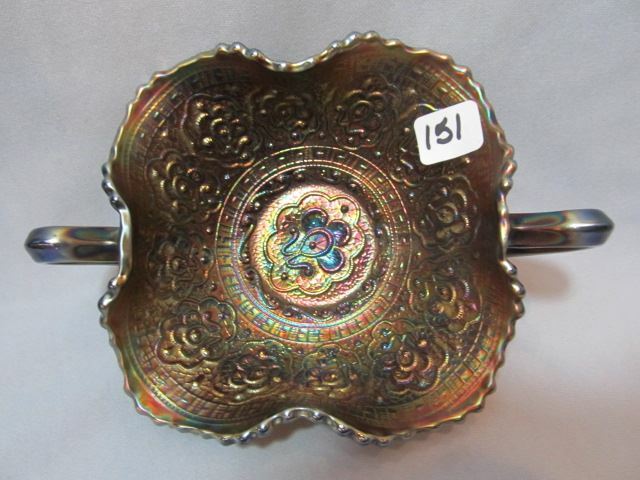 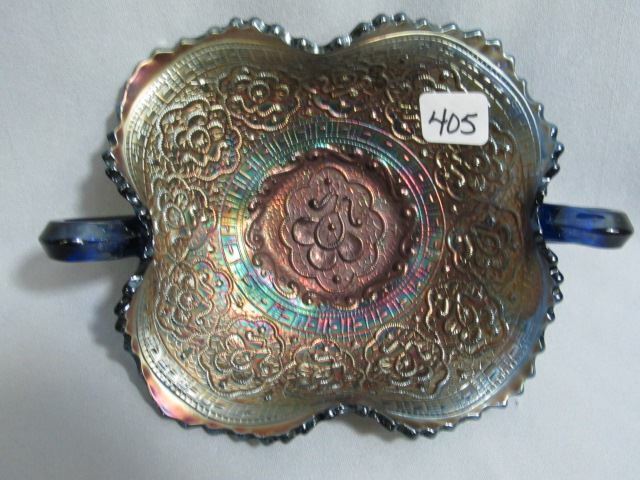 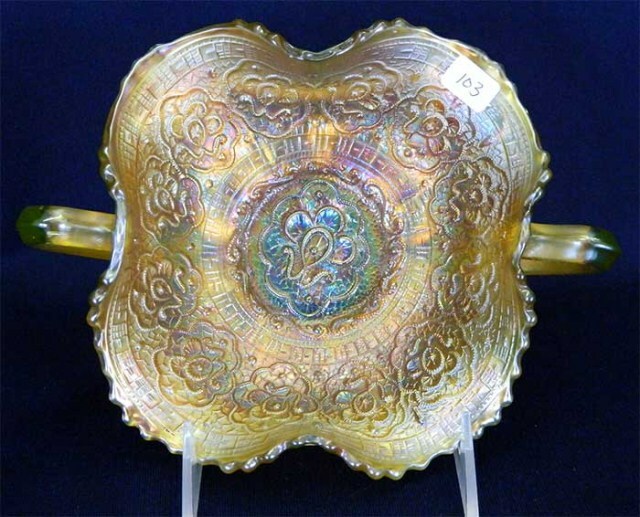 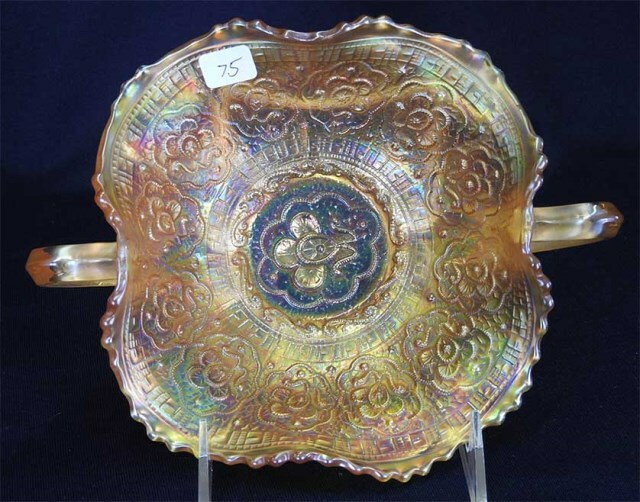 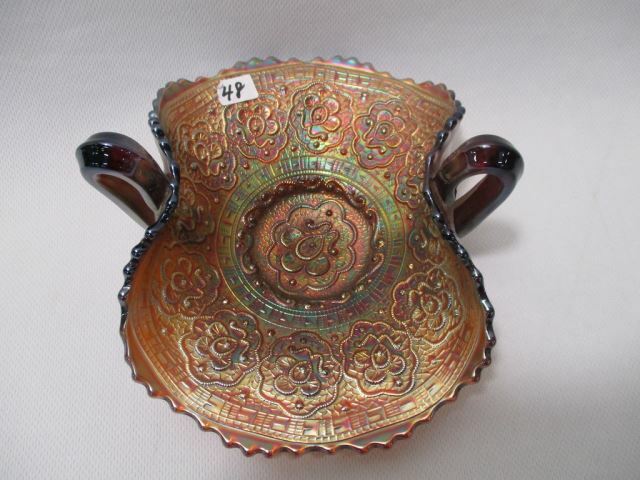 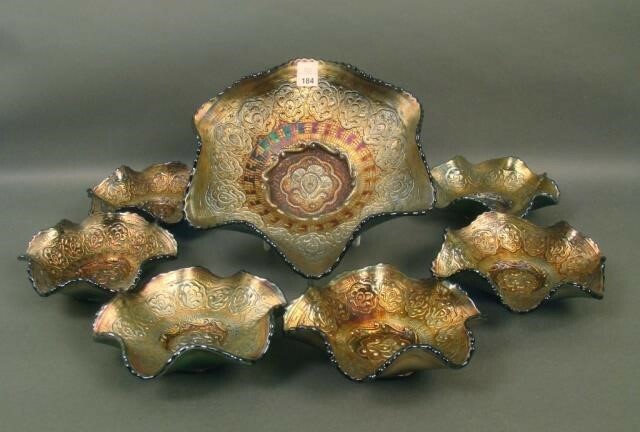 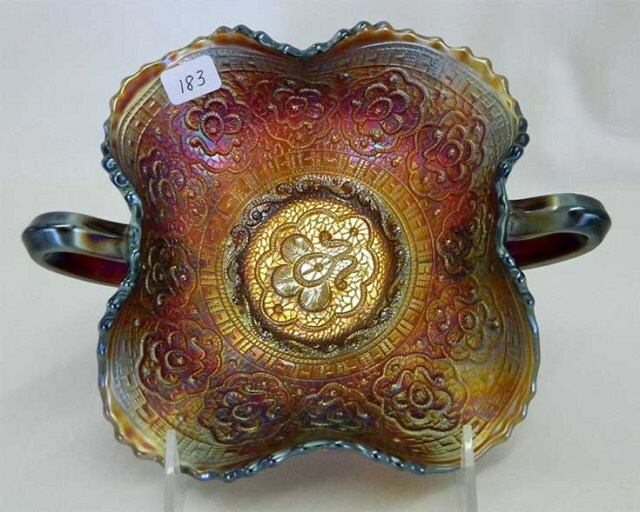 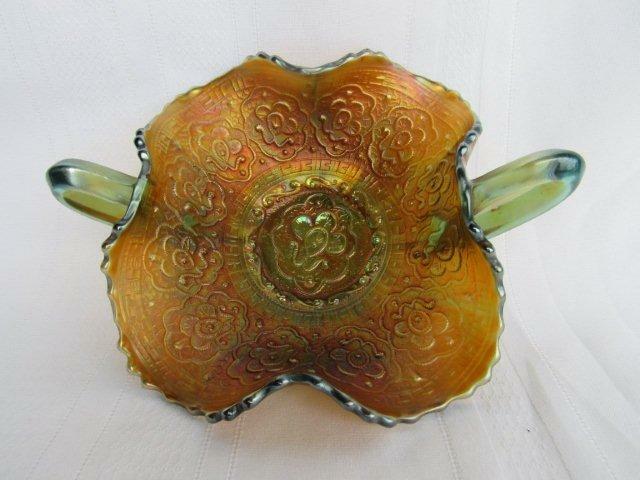 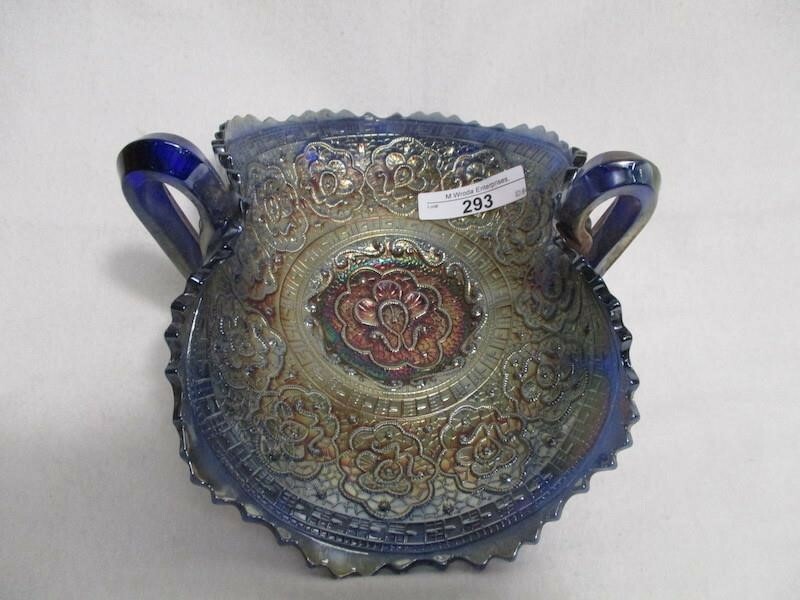 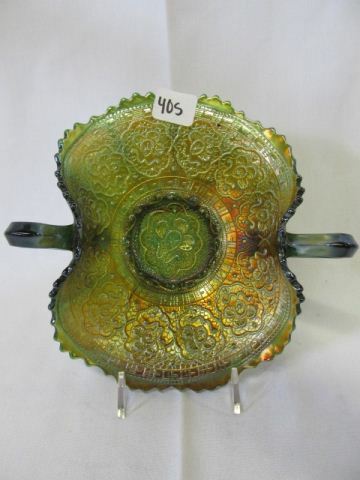 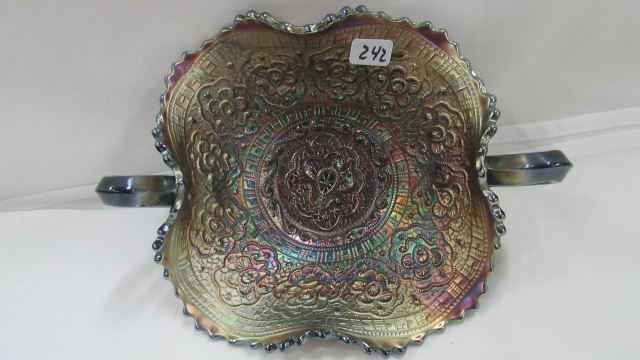 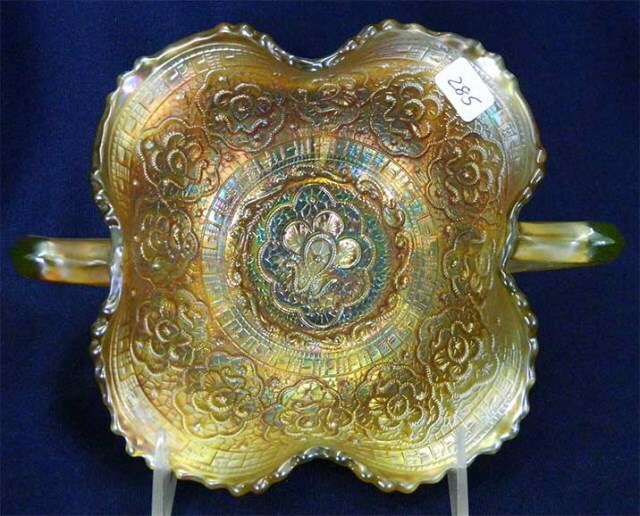 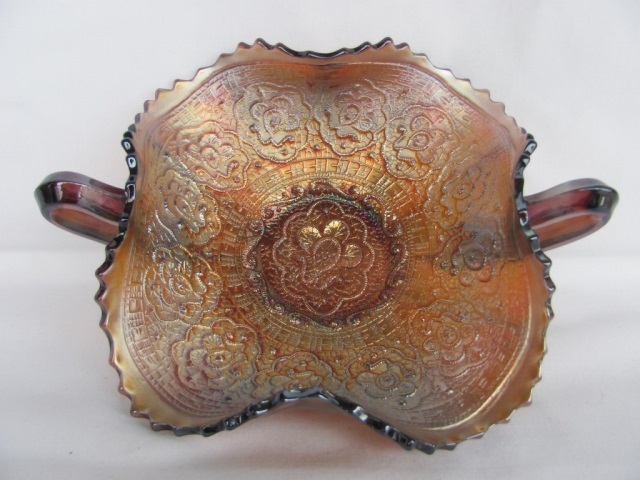 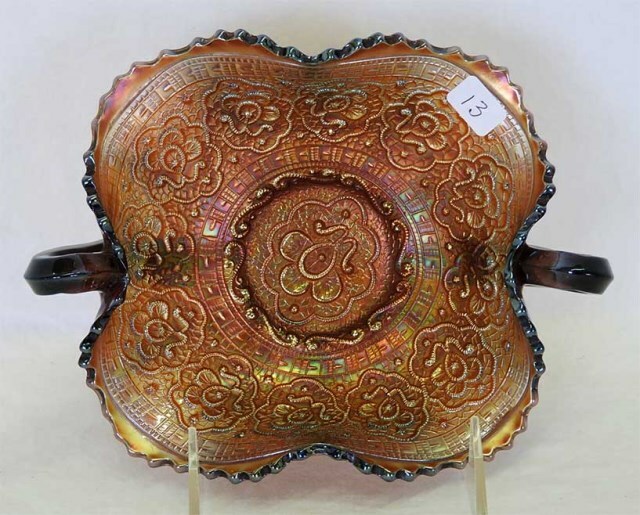 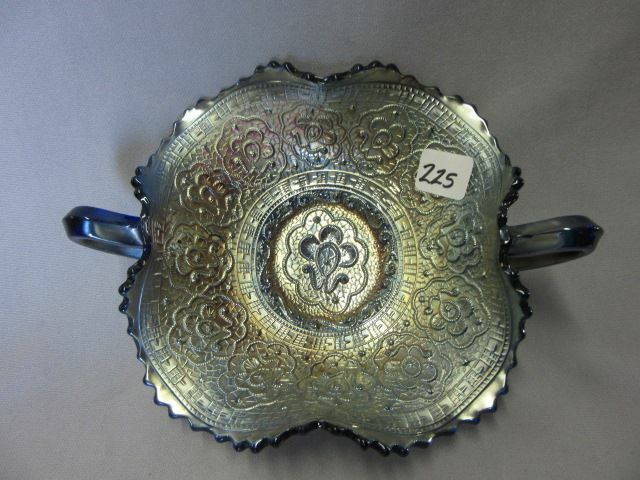 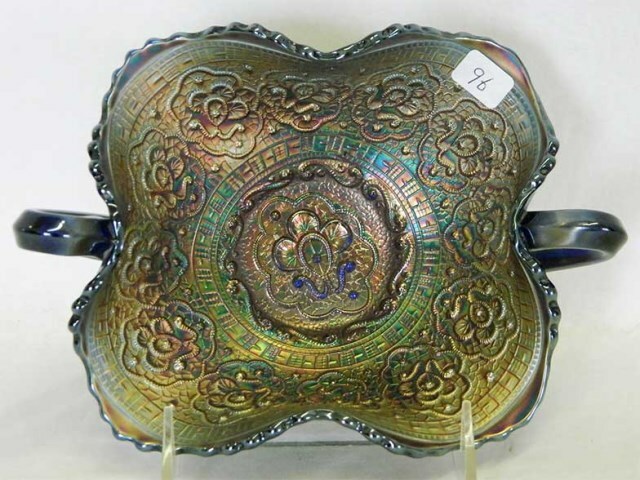 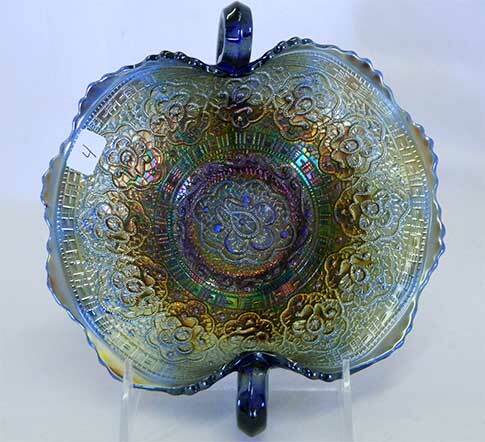 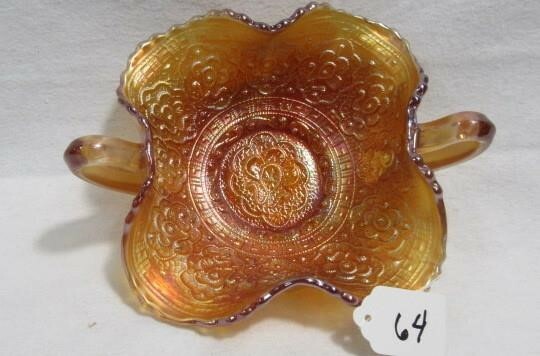 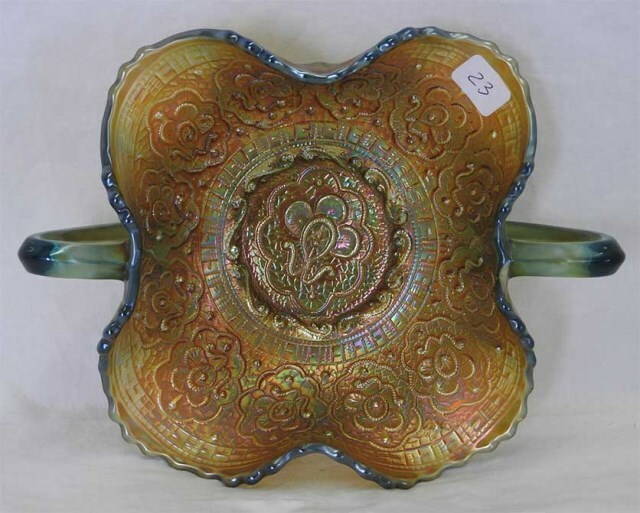 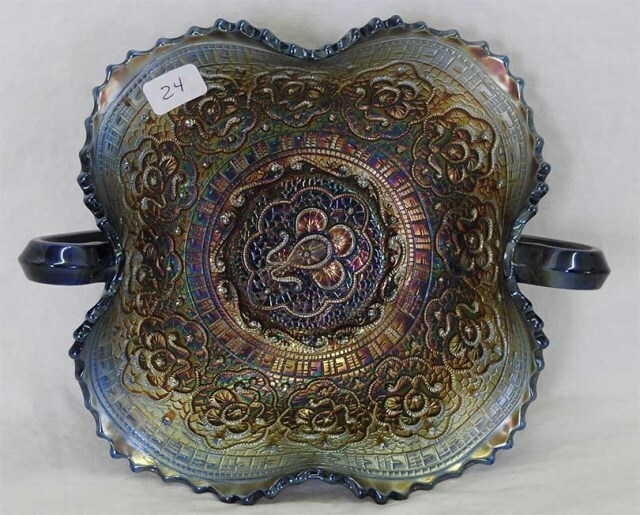 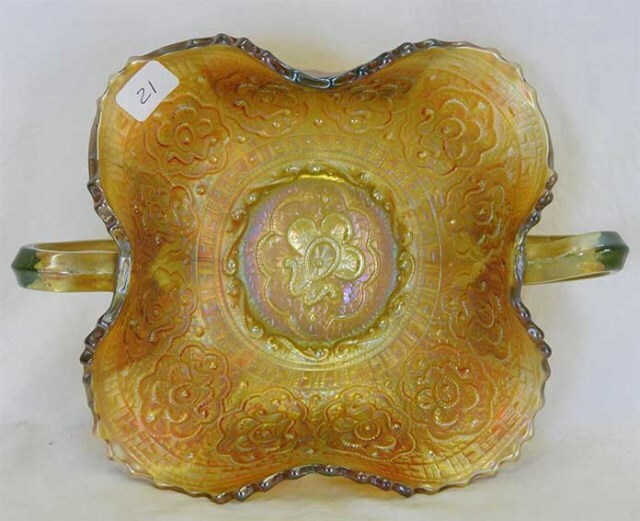 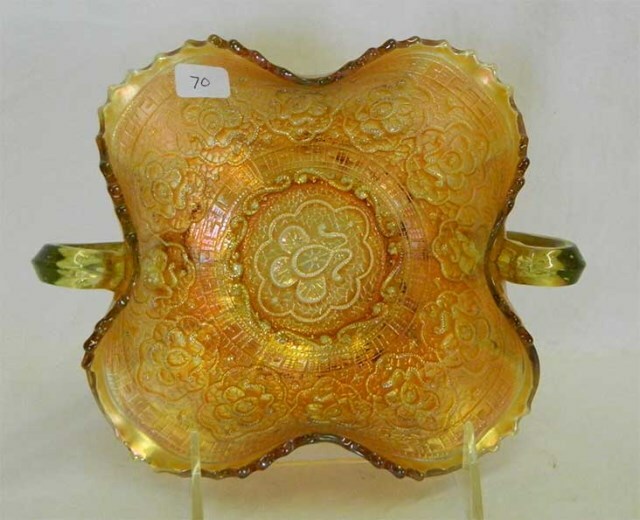 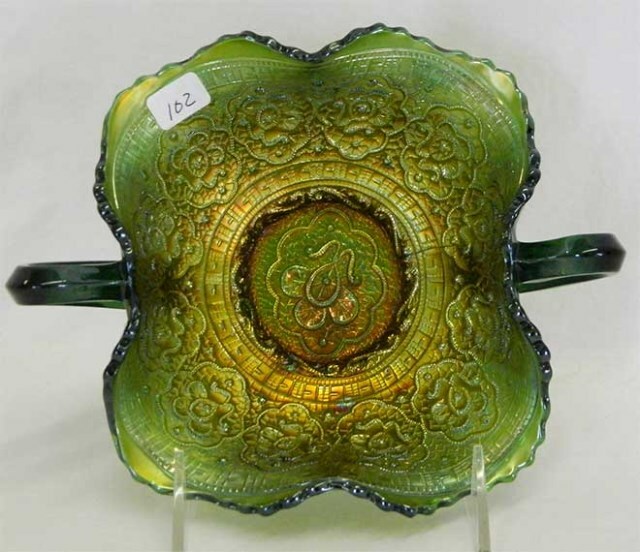 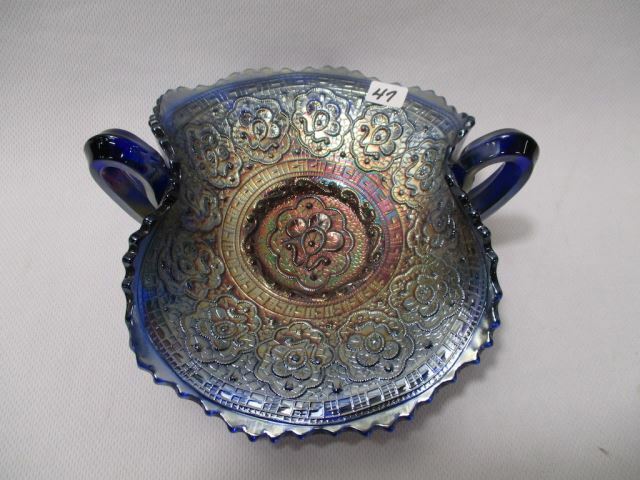 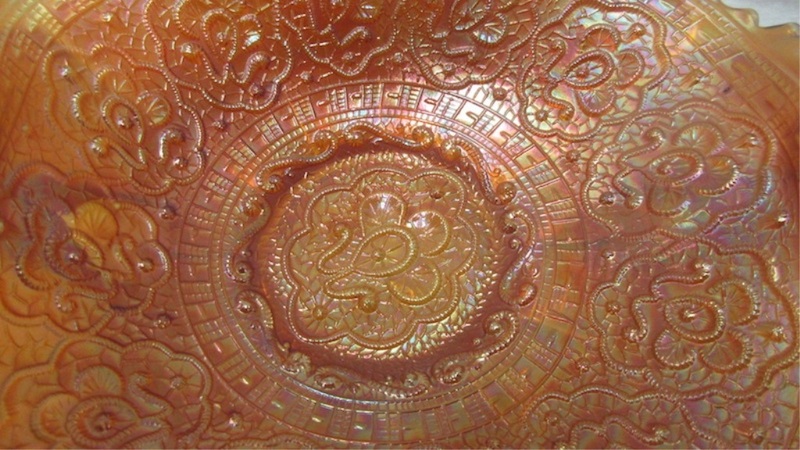 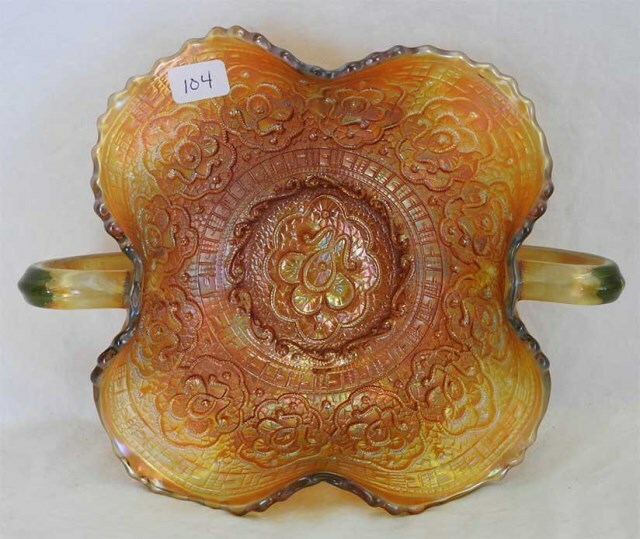 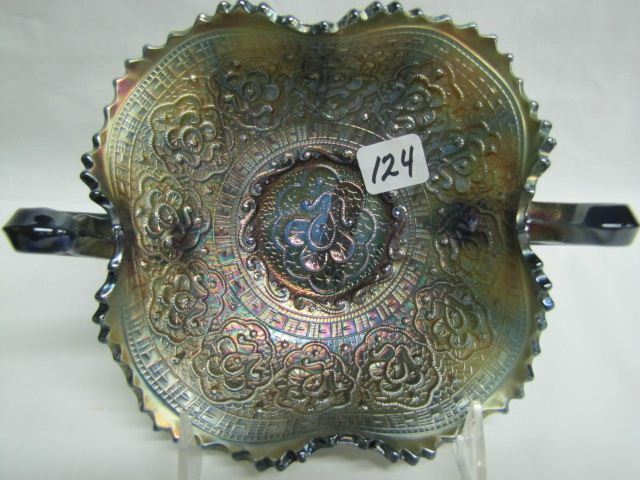 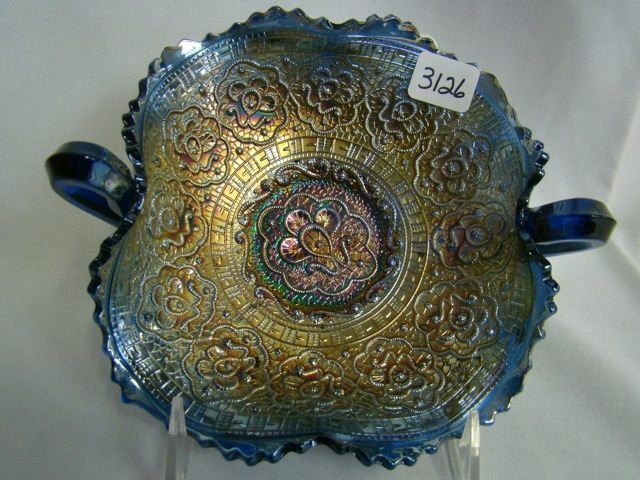 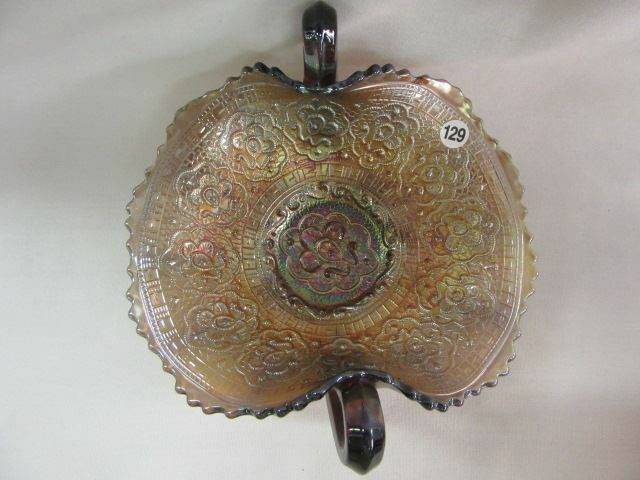 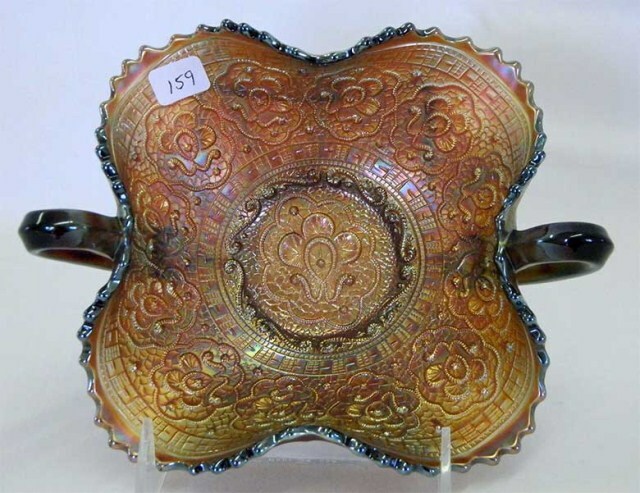 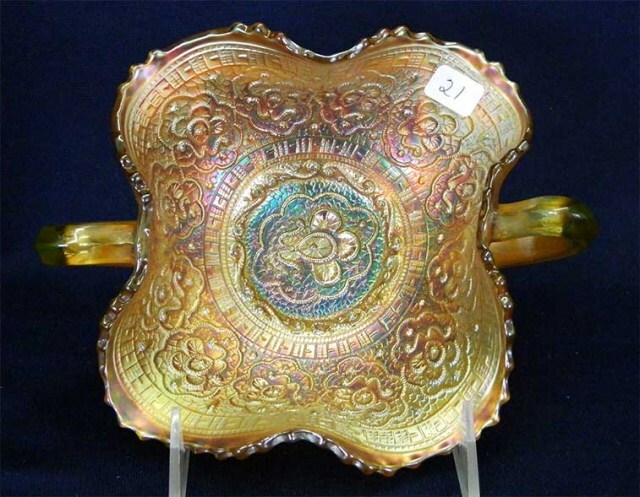 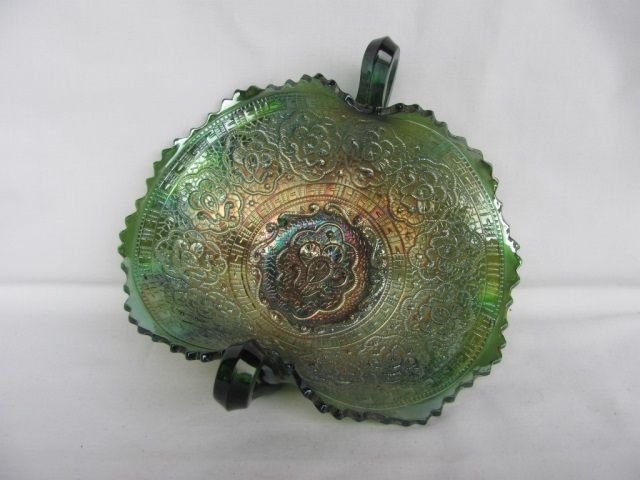 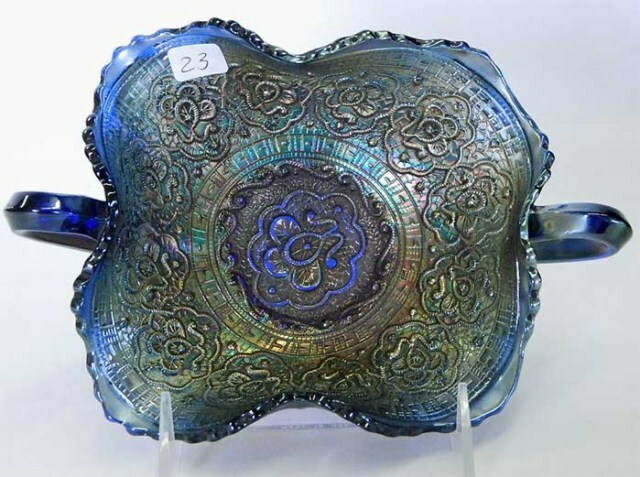 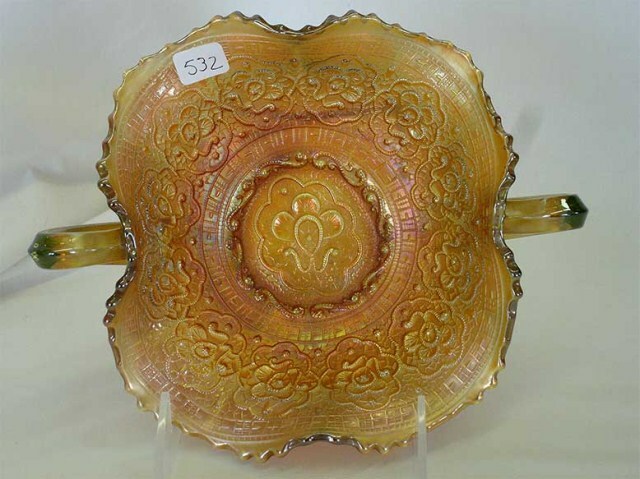 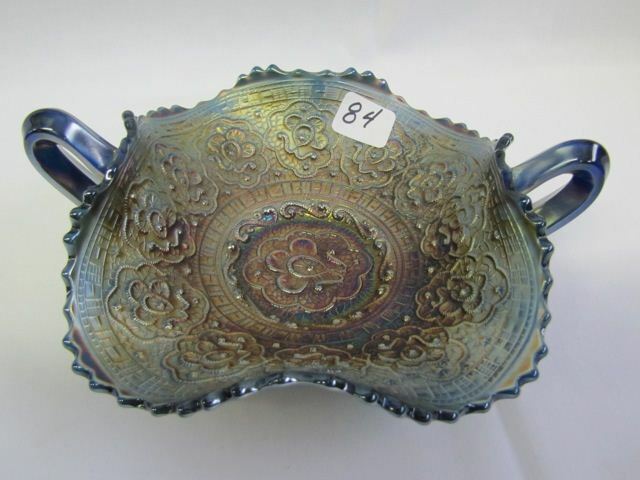 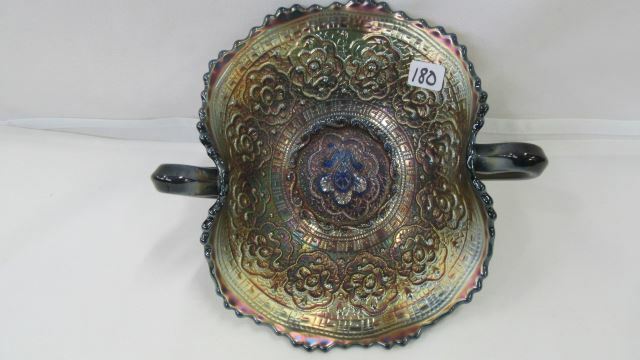 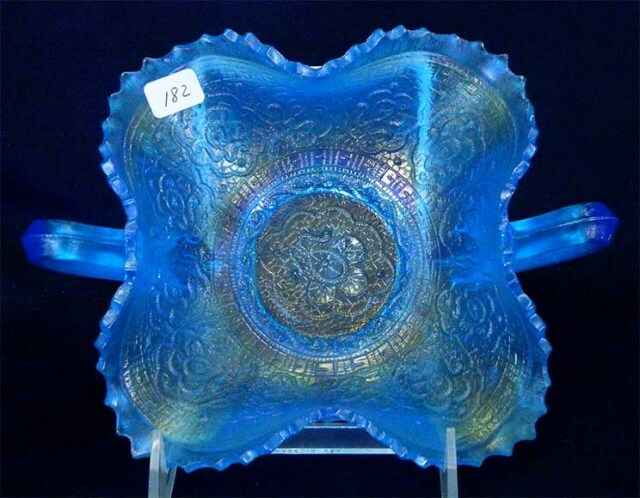 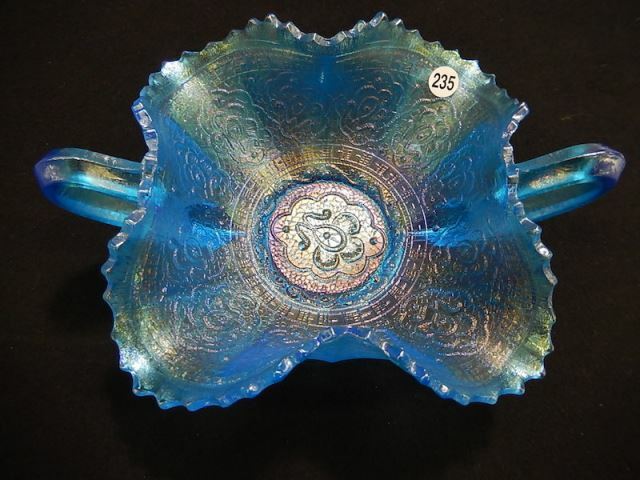 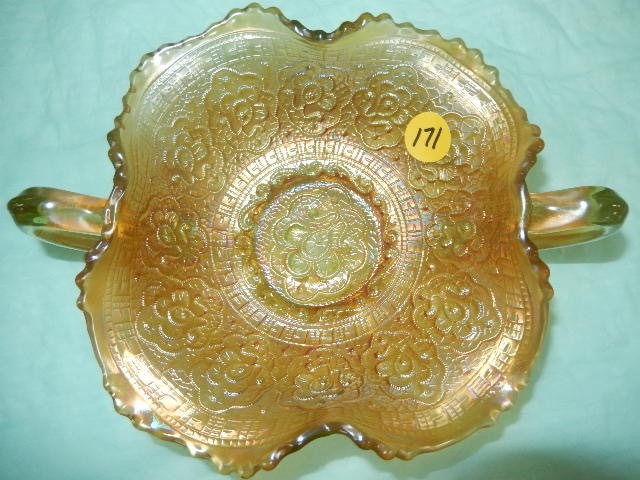 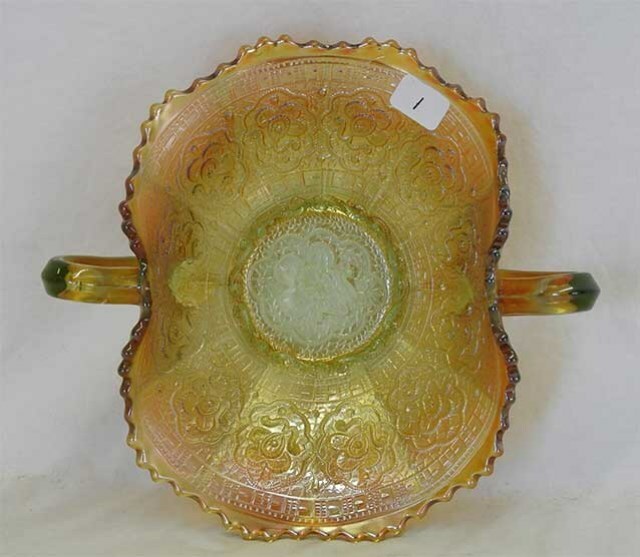 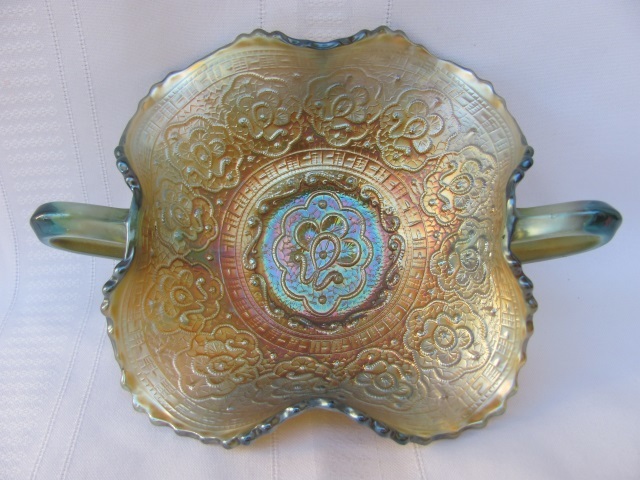 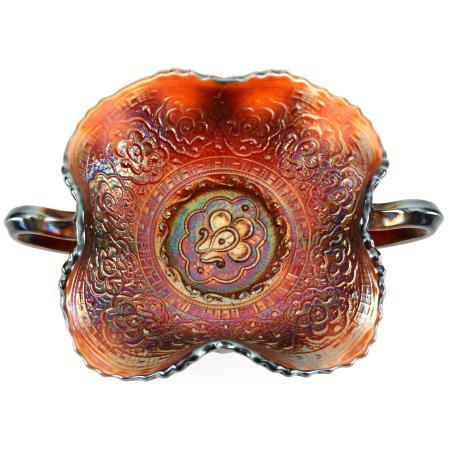 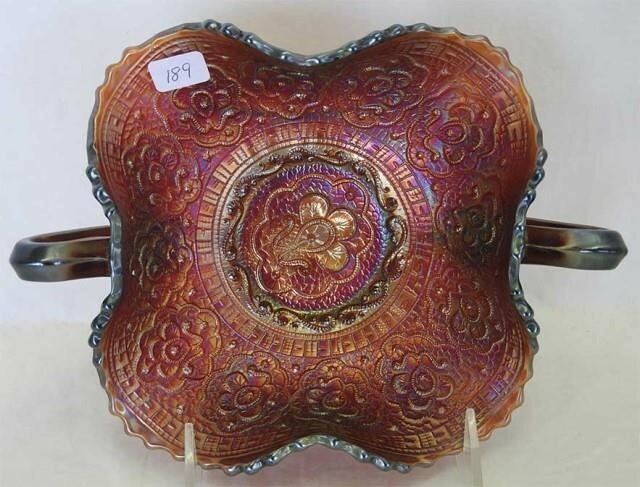 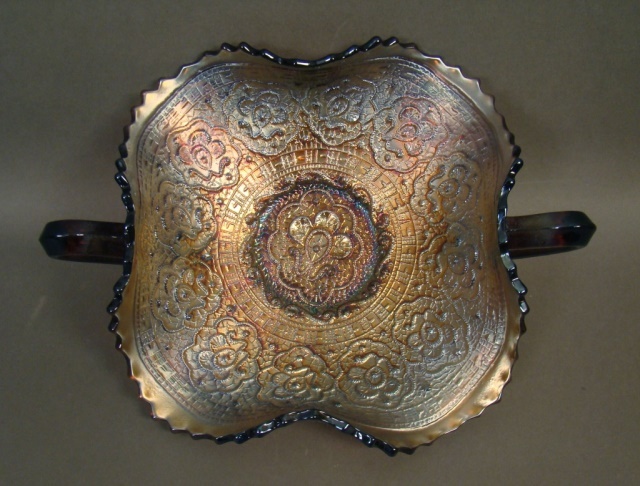 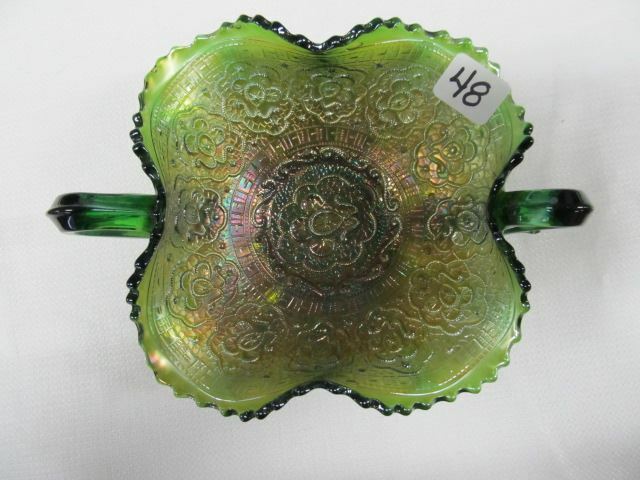 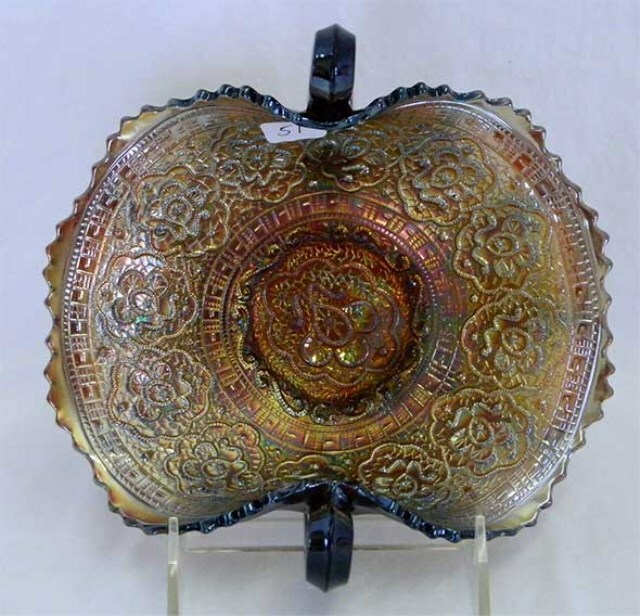 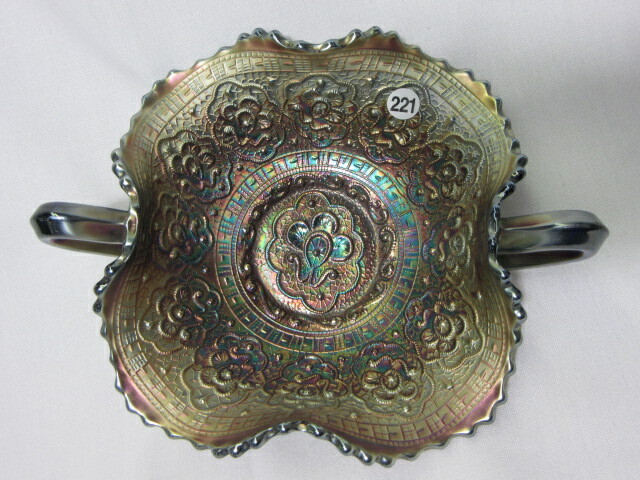 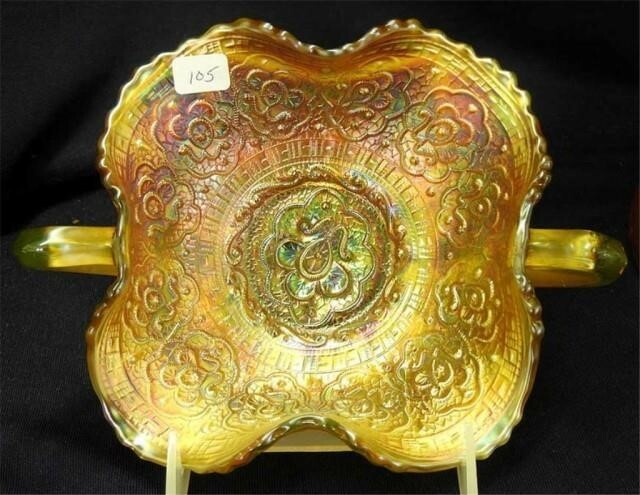 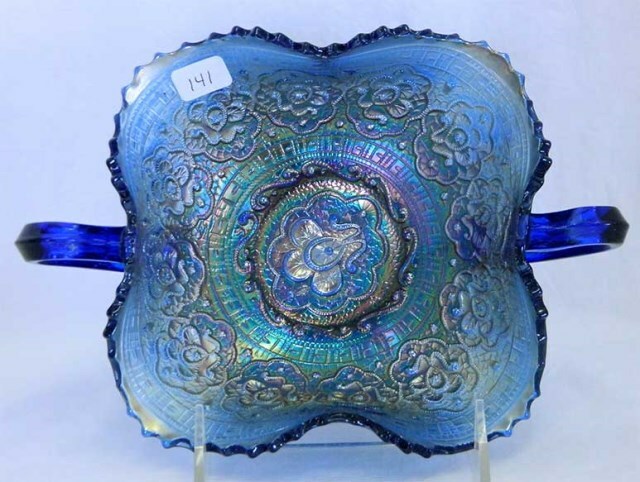 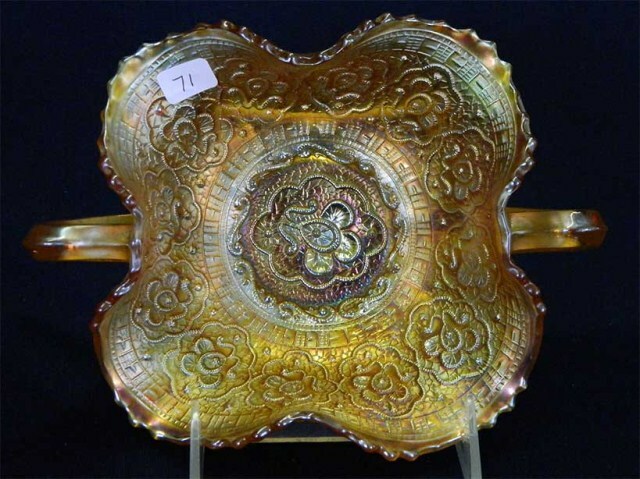 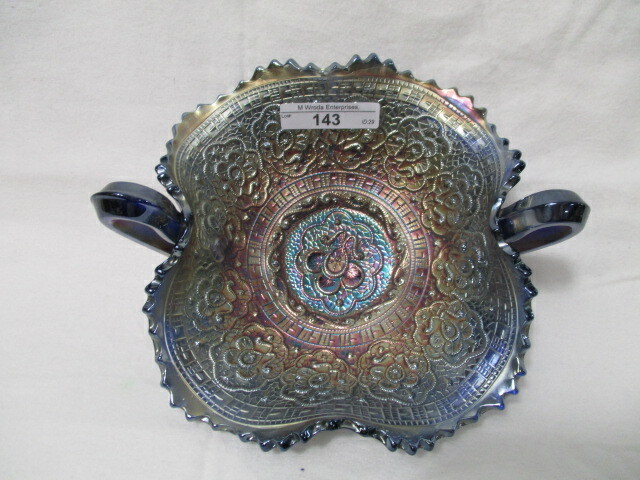 * Amethyst Persian Medallion plates were one of the first reissues Fenton made. 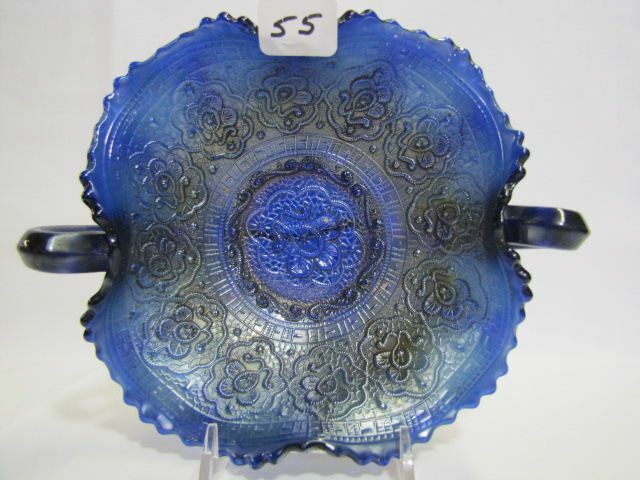 Some of these early plates did not have the Fenton logo. 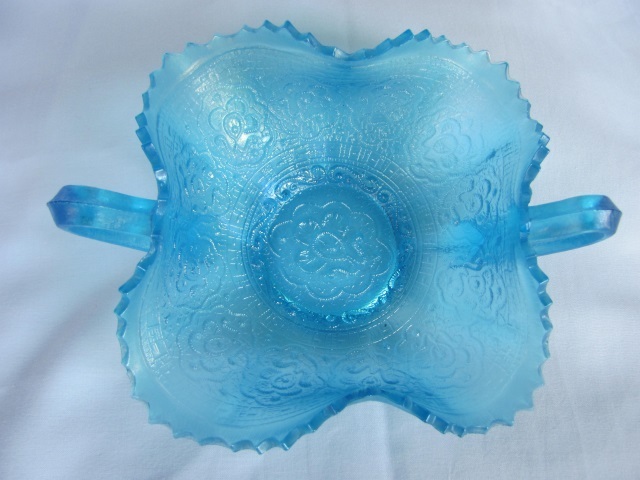 Because of this, they are often thought to be of the classic era. 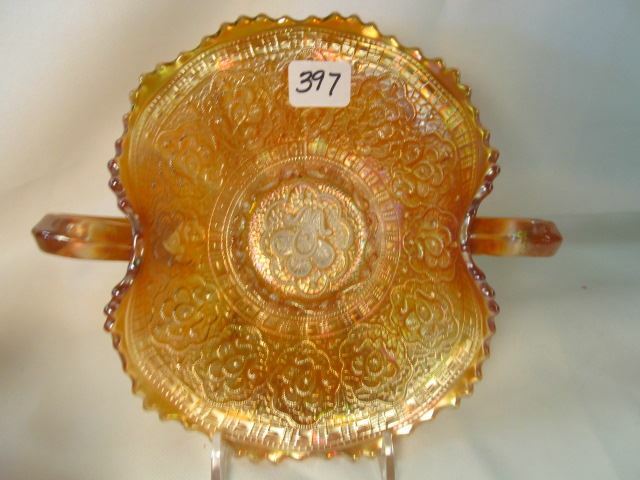 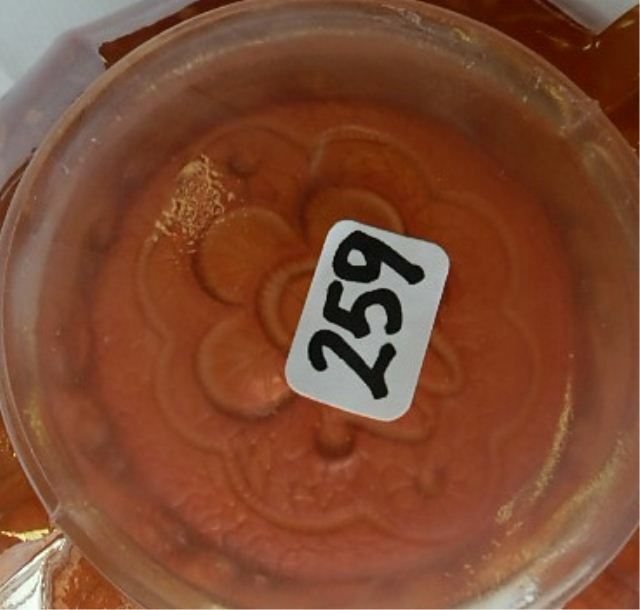 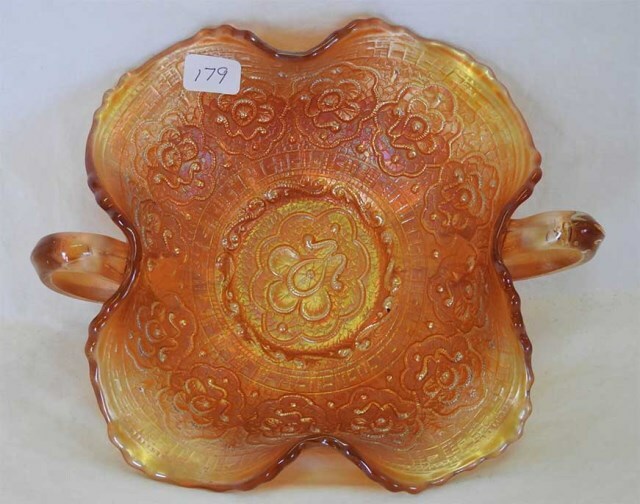 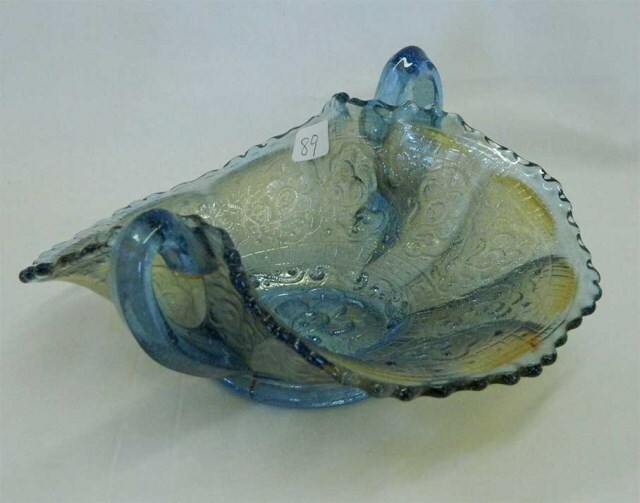 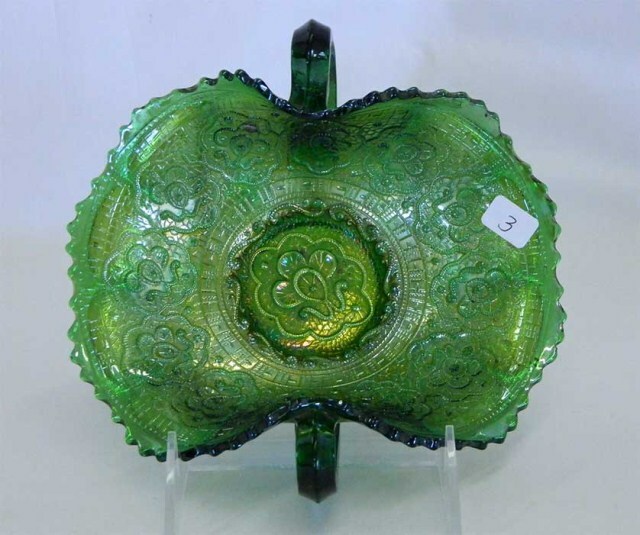 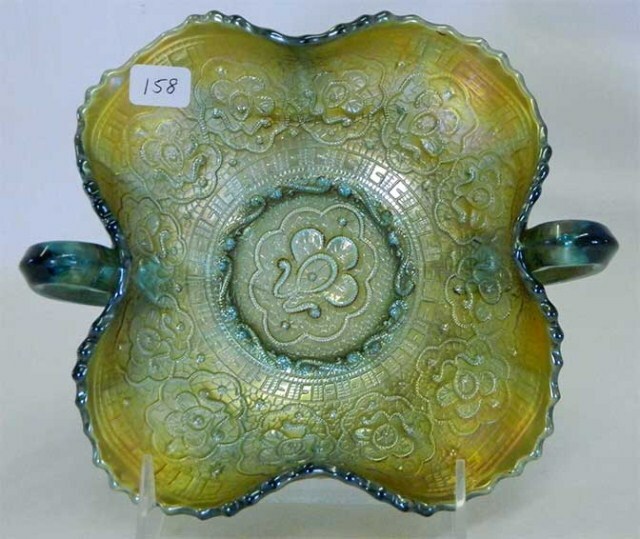 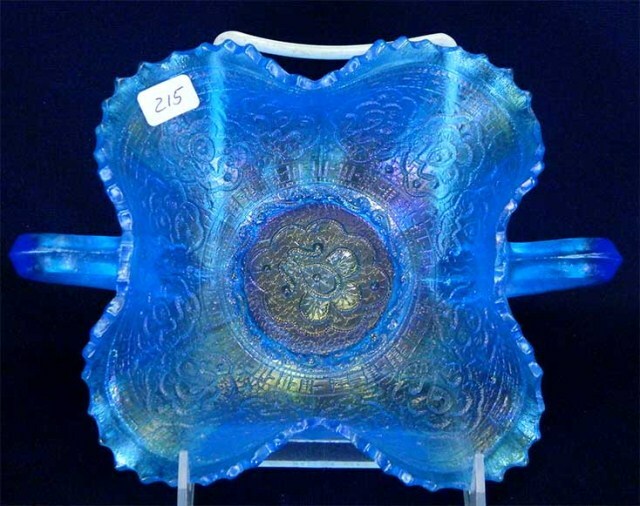 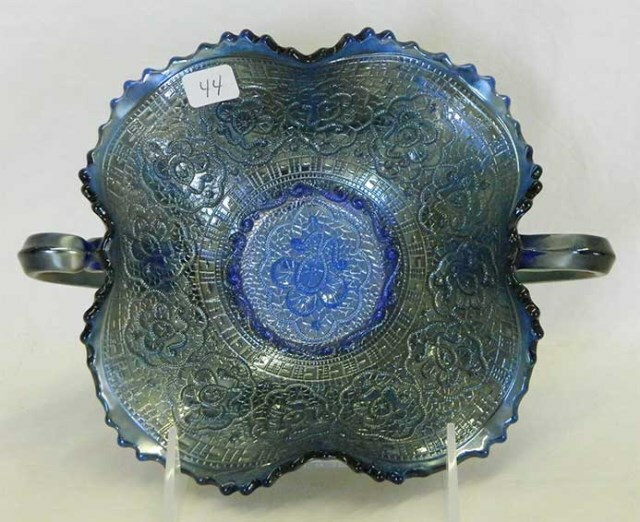 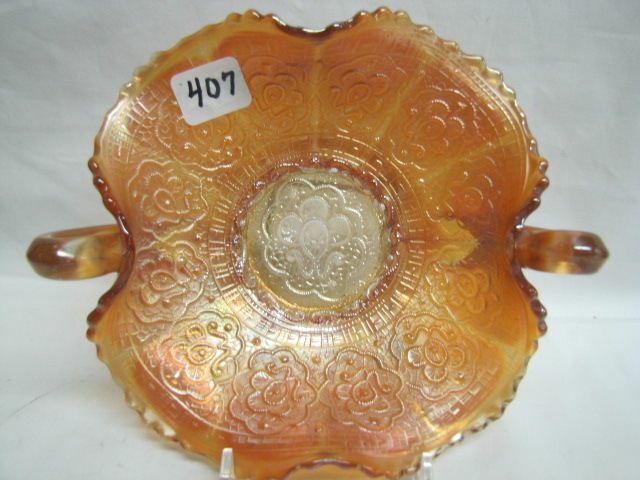 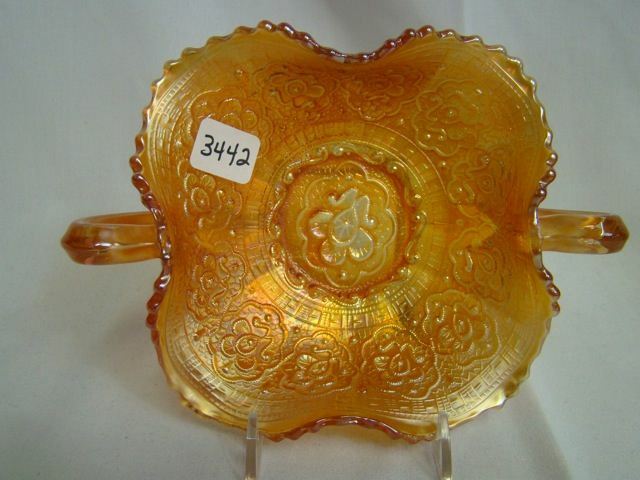 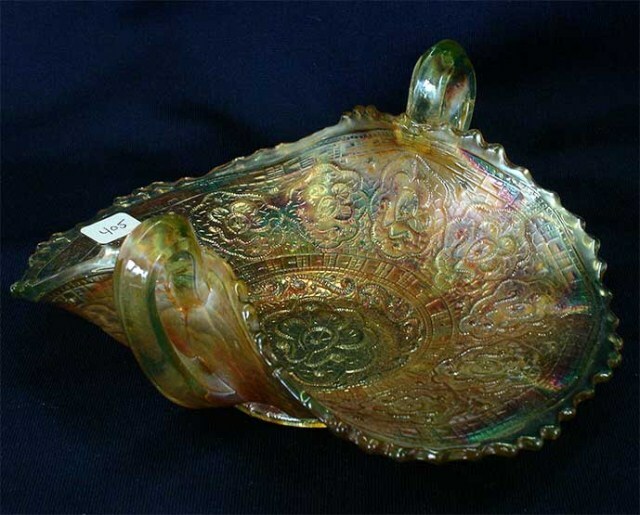 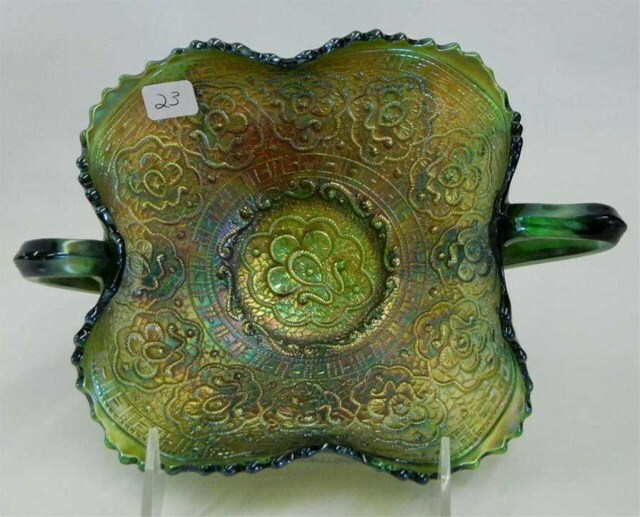 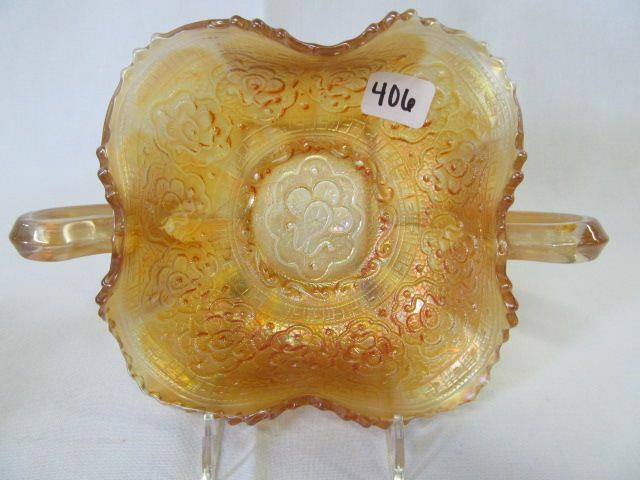 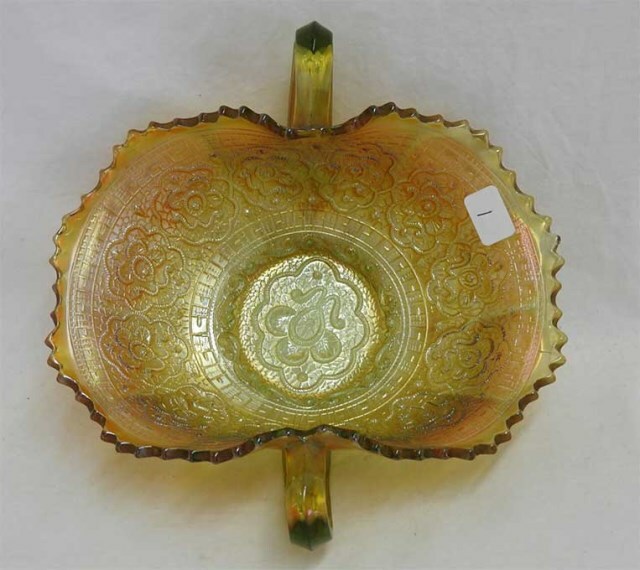 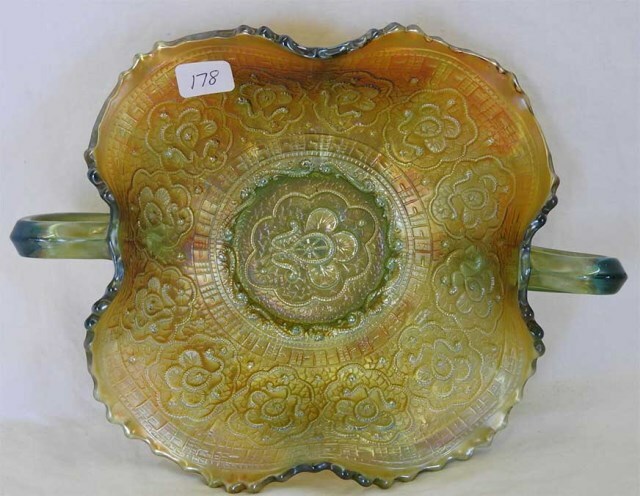 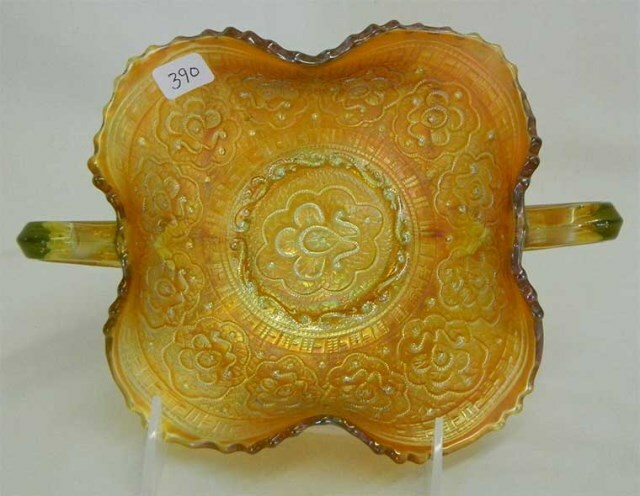 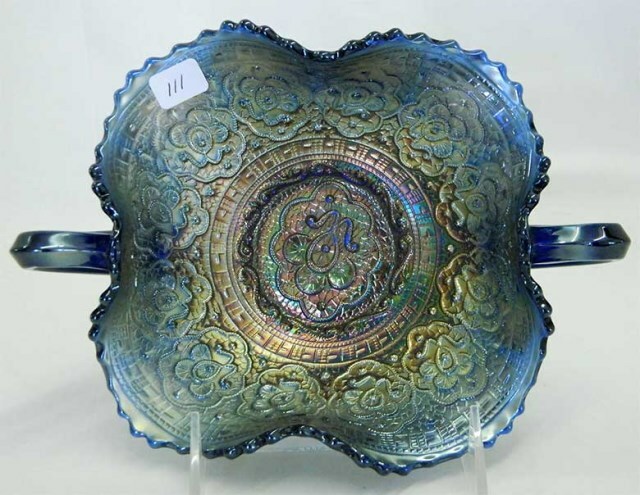 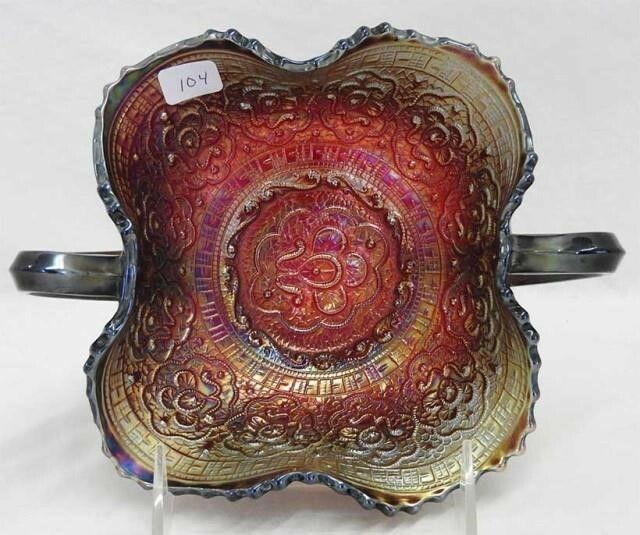 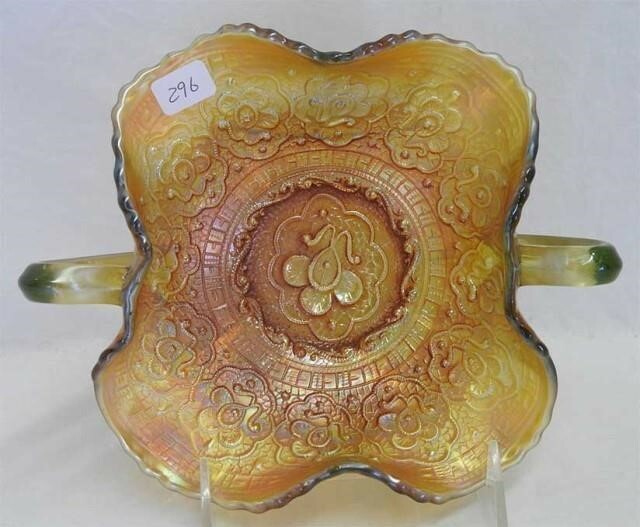 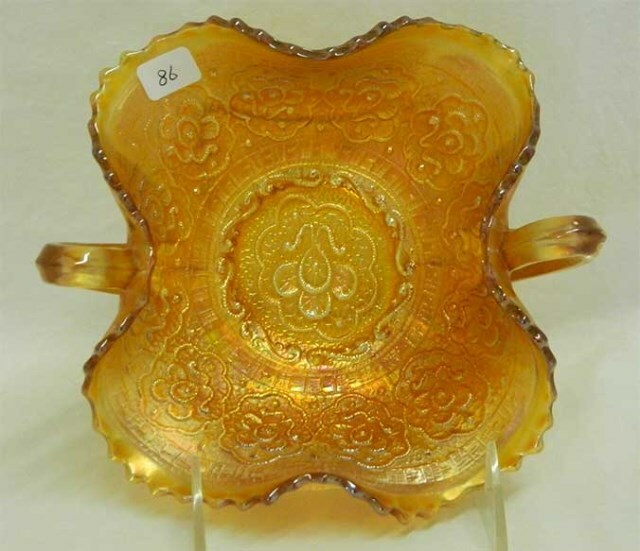 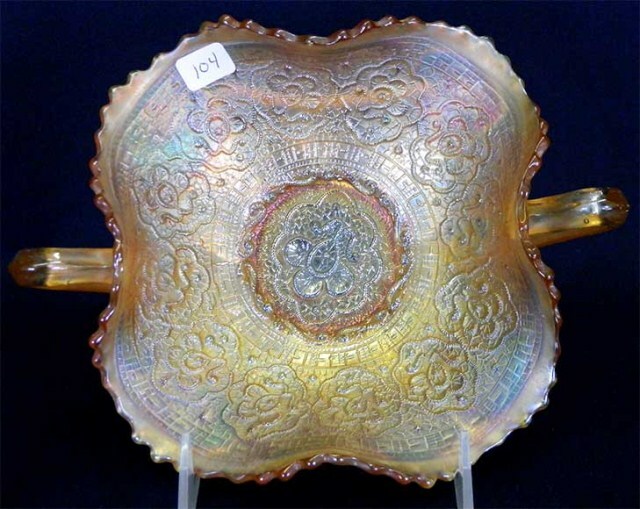 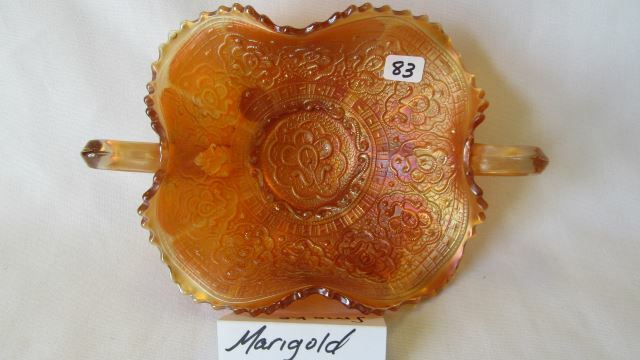 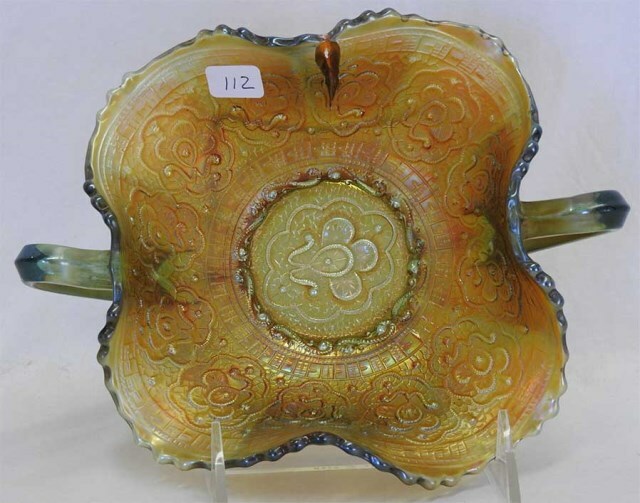 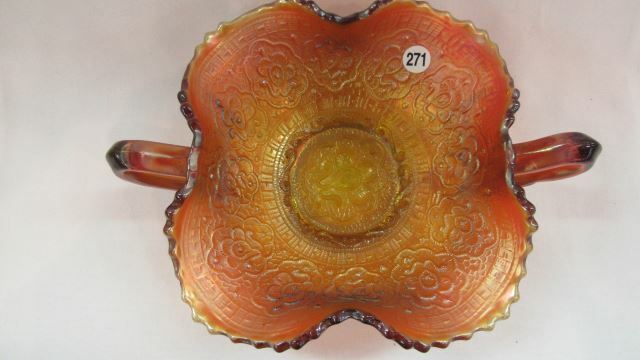 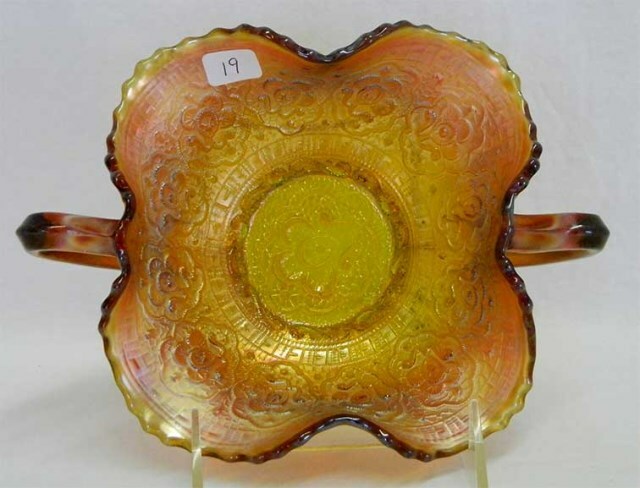 So, be very cautious when buying these amethyst plates–most are not old. 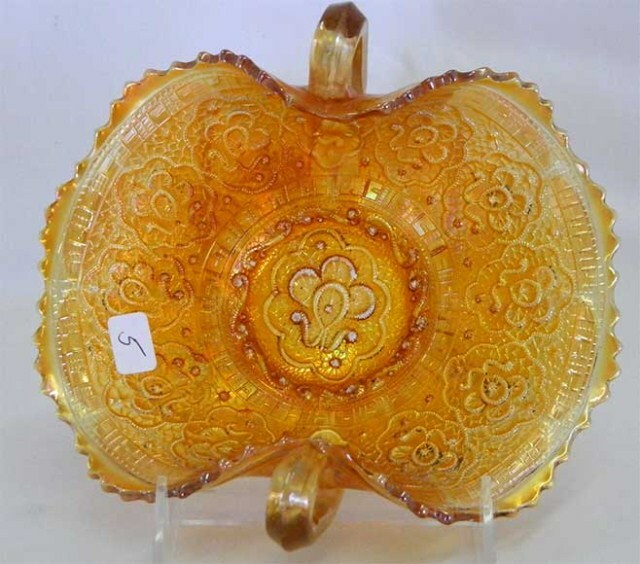 If the fruits are not on a plain background, it could be one of the reissued versions. 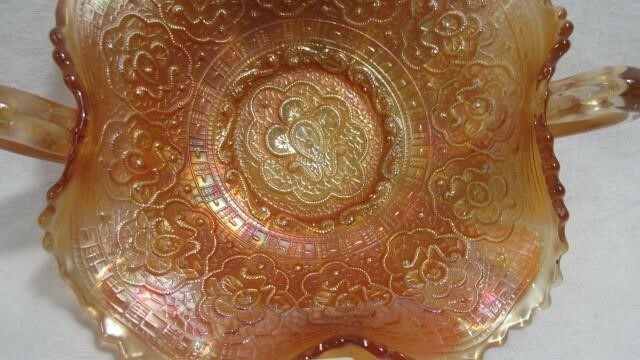 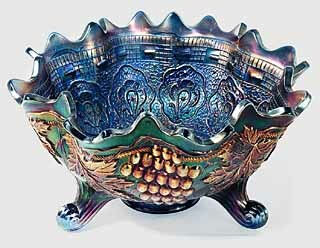 Footed fruit bowls (Grape and Cable exterior, Persian Medallion interior). 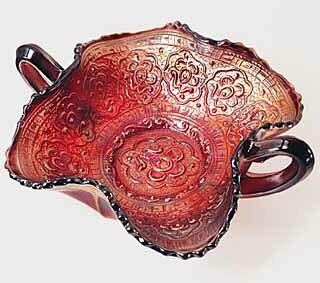 Compotes are found in two sizes. 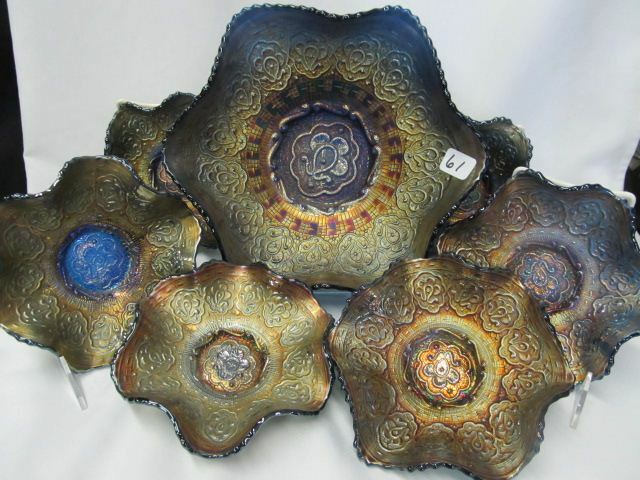 The larger has the medallion pattern on the exterior; the smaller has a wide panel exterior. 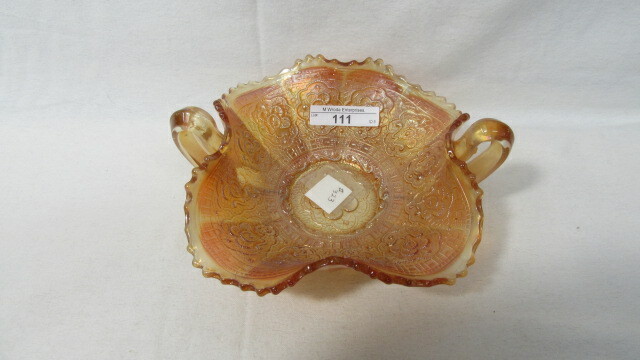 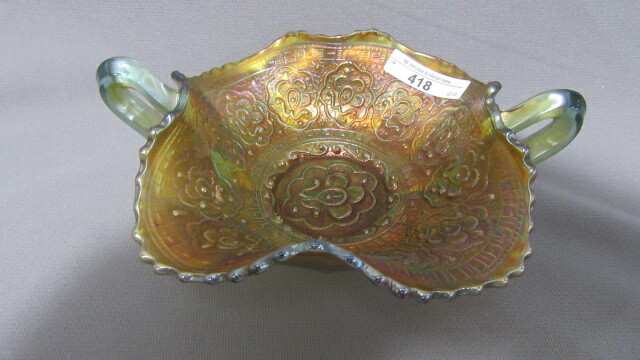 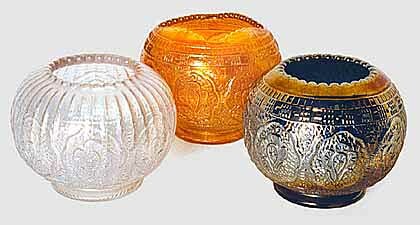 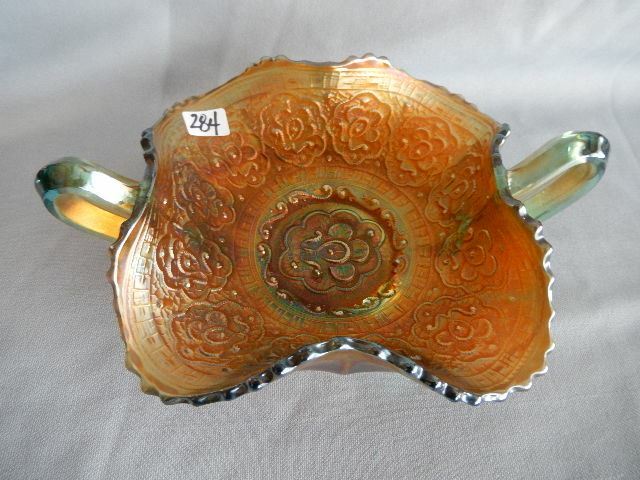 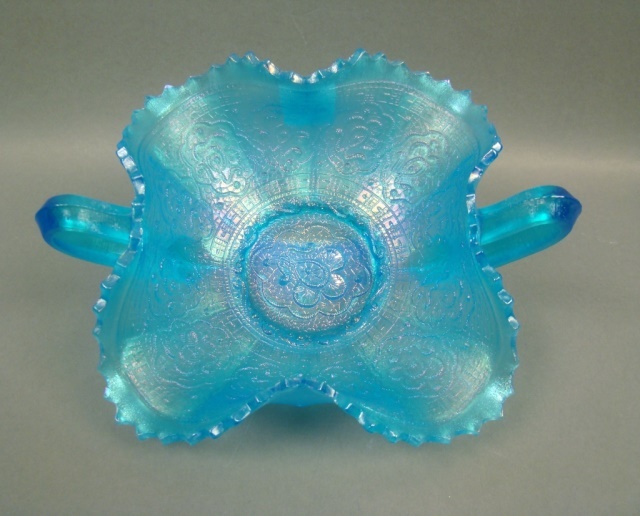 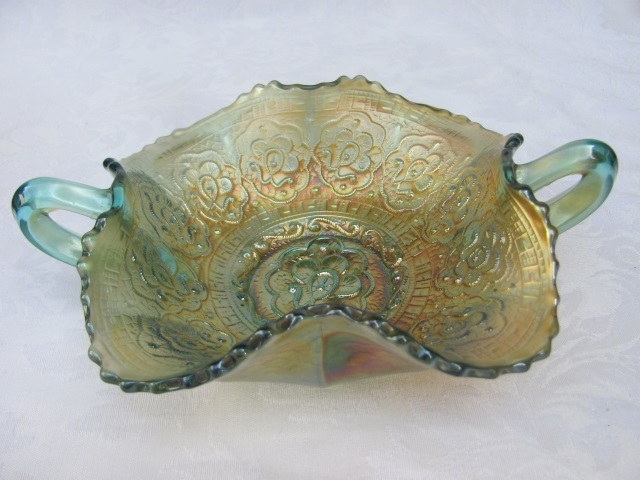 The rosebowls with a square top opening are called hair receivers.